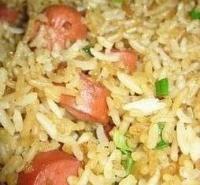 Arroz con Salchichas - Rice with Vienna Sausages - Tienditadepuertorico.com - Buy Puertorican Food Here!! Use a 5qt. pot at medium heat. Rinse the rice and add to the other ingredients. Turn heat up to medium high and stir well. When it starts boiling, lower the heat to medium, and let the rice completely dry out. bubbling with the yummy liquid. Stir the rice with a large spoon, bringing the rice at the bottom to the top. Cover the pot to a tight fit with the lid and aluminum foil and reduce the heat to low. After about 20 minutes, uncover and turn the rice again using the large spoon. Remove the pot and set it on a cool burner. Let stand for about 6 minutes then remove the lid. Serve with Habichuelas (Beans) and tostones (Fried Plantains).